McLaren has introduced the 600LT Spider to its Sports Series and it's more track-focussed and lighter than its hard-top sibling. Based on the 570S Spider, the McLaren 600LT Spider delivers more power and fewer kilos, offering up a more track-focussed drive than ever. Under its skin, you'll find the same mechanicals as it's coupé counterpart but its 3.8-litre twin-turbocharged V8 now pumps out 592bhp and 620Nm of torque. All of those horses are sent to the wheels via a seven-speed dual-clutch gearbox which results in a claimed 0-62mph 2.9 seconds. With the roof down, it'll crack on to 196mph, just 5mph shy of the 201mph with the roof raised. It's not only the extra power that helps the McLaren's performance figures. Due to the carbon fibre monocoque, which requires no extra strengthening to accommodate for the missing roof, the 600LT Spider is just 50kg heavier than the Coupe. At speeds below 25mph, the electric roof can be raised or lowered while a wind deflector, well, deflects the wind and reduces turbulence in the cockpit so your passenger's excessively expensive hairdo won't be destroyed. Select the MSO Clubsport Pack and the 600LT Spider goes on a diet too, shedding 100kg by wearing lightweight gear like titanium wheel bolts, carbon fibre bits inside and out, including carbon fibre race seats. If that's still not good enough, McLaren will remove the in-car audio set-up and the air-conditioning system too. 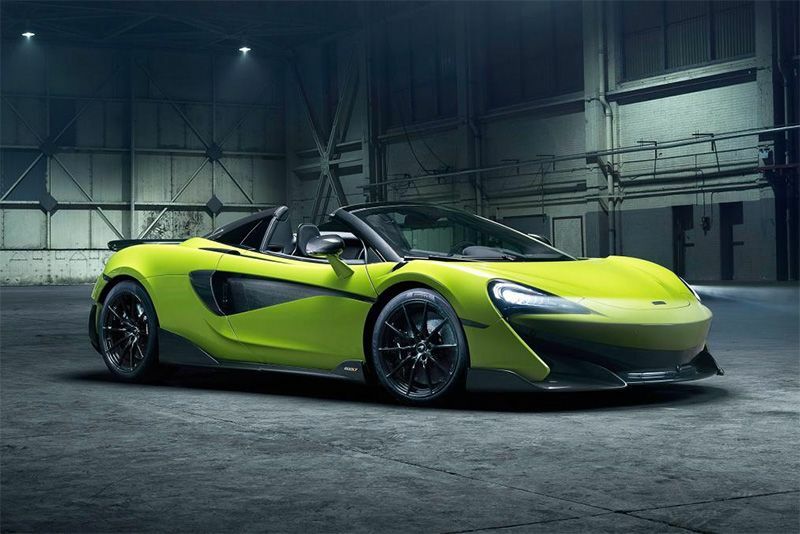 The McLaren Production Centre in Surrey will hand-build limited numbers of the 600LT Spider as per its Coupe counterpart over the course of 12 months, starting in March. Owners should start receiving deliveries a few months after that. The McLaren 600LT Spider is available to order now with price starting from £201,500 – the MSO Clubsport Pack is an £18,200 option.